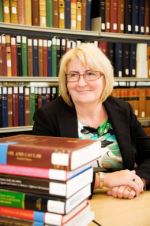 Margaret Ross graduated LLB Hons from Aberdeen in 1979 and qualified as a solicitor in 1981. She has been on the staff of the university as a tutor since 1980 and was appointed to her present post in 1992. She was Deputy Head of the Law School from 2000 to 2003, Head of Law from 2008 to 2011 and has been a member of both the University Senate and the University Court. From 2011 to 2017 she was a University Vice Principal and Head of the College of Arts and Social Sciences, and from 2015 to 2018 she became Vice Principal for People Strategy which included responsibility for Equality and Diversity. She links her research interests in evidence, procedures and mediation with family law and mental health contexts. She is the author of the revised edition of the leading text on the law of evidence in Scotland. Her publications include journal articles and book chapters about evidence, alternative dispute resolution, and the procedures of courts and professional bodies. She has held positions as Vice Chair of the Mental Welfare Commission for Scotland, an independent reporter for the court in adoption applications and chair of Grampian Research Ethics Committee. She has held board positions in charities offering support and advice in times of dispute and is a school governor. Evidence, Procedures, Dispute Resolution processes. The role of dispute resolution within civil justice processes in Scotland. Professor Ross is interested in supervising research students working in the following areas: alternative dispute resolution, civil procedure, evidence and mental health law.